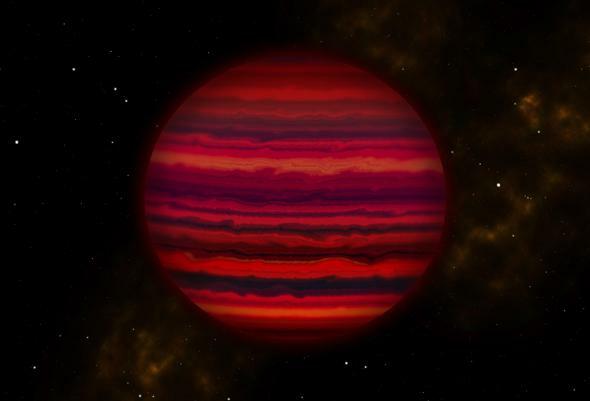 Brown dwarf WISE 0855 found to have clouds of water in its atmosphere. If you were floating above WISE 0855 and had infrared-sensitive eyes, this artwork is pretty much what we think it would look like. Just 7 light-years away from the Sun—practically in our laps in galactic terms—lies an amazing object. Called WISE 0855, it’s not really a star, because it is far too low in mass to ignite nuclear fusion in its core. That’s the gold standard for stardom, and WISE 0855 falls far, far short of it. Objects like that are generally called brown dwarfs, but even then it’s not clear; WISE 0855 has between three and 10 times the mass of Jupiter, and brown dwarfs fade down into planets near the top of that range. So it may very well be a very massive planet. But it doesn’t orbit a star. If it’s a planet, it’s a rogue planet. Amazed yet? There’s more: The temperature of this borderline object is only about 250 Kelvins, which is -25° or so C. That means the surface temperature is below the freezing point of water. All this has been known for a couple of years, actually, but we’re still not done. A new and difficult set of observations of WISE 0855 were made recently, and they indicate that the rogue planet may have water clouds in its atmosphere! If true, it joins just four other objects known to have them: Jupiter, Saturn, Mars … and Earth. This makes it the first object outside the solar system known to have them. So how was this determined? Astronomers observed WISE 0855 with Gemini North, one of the largest telescopes in the world capable of observing infrared light. That’s important, because even though WISE 0855 is the seventh-closest known object outside the solar system, it’s so cool that it’s incredibly faint. They observed it for 14 hours over two weeks, and even then the data they got were noisy. But they were clean enough, and that’s what counts. Left: The spectrum of WISE 0855 (black) compared with a theoretical model with clouds (blue) and without (orange). Right: WISE 0855 compared to Jupiter (blue). The vertical scale is brightness, and horizontal is wavelength (think of it as color). The astronomers took spectra, breaking the light of WISE 0855 into separate colors. Different molecules in its atmosphere absorb light at very specific wavelengths, so by looking for gaps in the spectrum the constituents can be identified. The spectrum can also be compared with other objects like Jupiter, as well as atmospheric models created using the known physics of these objects (using things like their mass, temperature, density, and lots of different atmospheric gases to calculate what their expected spectra should look like). What they found were absorption features consistent with water vapor clouds. Not only that, they compared the spectrum to models of a similar object with and without clouds, and the model with clouds clearly fit better. The models aren’t a perfect fit, so there’s more going on here, perhaps cloud structure letting light through from different altitudes, or the object has a slightly different chemical composition than is being modeled. Interestingly, the redder (longer wavelength) part of the spectrum from WISE 0855 fits that of Jupiter pretty well, but at shorter, bluer wavelengths they diverge strongly. That part of Jupiter’s spectrum is dominated by absorption from phosphine (PH3). * The scientists note that in Jupiter, hotter gases from its interior mix with cooler stuff higher up, creating conditions where phosphine can exist. Perhaps WISE 0855 lacks that turbulent mixing. I find that rather amazing: Just by comparing the two spectra we can start making educated guesses about the interior of a massive object more than 70 trillion kilometers away. Given the really odd nature of this beast—neither planet nor brown dwarf but with qualities of both—and how close it is, I suspect this will be an early target for the James Webb Space Telescope. With its huge mirror and high sensitivity in the infrared, the orbiting observatory should be able to give us much, much better data as it picks apart the light from WISE 0855. That’s due to launch in 2018, so who knows? In a couple of years we may know a lot more about this faint, cold, lonely wandering world between the stars. *Not to be confused with iludium phosdex, the shaving cream molecule.